This is what we were up to today (actually I can only say today for another 8 minutes)! We were very lucky to have press passes so we met the cast after the show, AND had a picnic in the fox's underground house the stalls bar :-) I piled our plate high (because it was for both of us) but we polished it off so quickly that Aaron headed off, plate in hand to get some more. SO cute he came back with just 1 sandwich (for him) and 3 strawberries. I said Aaron "you don't eat strawberries why did you get them?" to be told "I got them for you Mummy" - sometimes he truly melts my heart! So, over to the review. First a bit of background. "Tall Stories' magical musical adaptation of the award-winning picture book by former Children's Laureate Julia Donaldson MBE and Alex Scheffler (Illustrator) is back in the West End for Christmas for the 6th time and will be on tour in the UK throughout 2014! .... Through rehearsals, we worked with the performers, designers and composers to come up with the production which opened at Chester Gateway Theatre in May 2001. 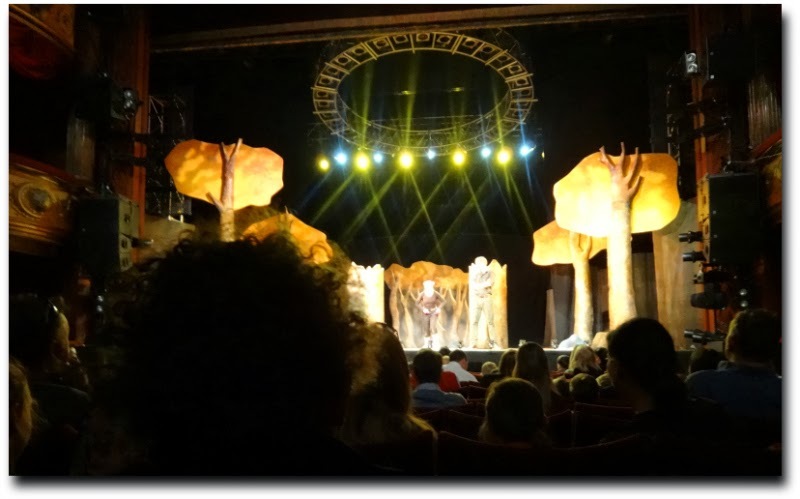 A few weeks later, Julia Donaldson and Axel Scheffler came to see the show as we sat nervously in the wings. Fortunately, the show got their approval and both have been back to see the production as it has developed over time". "First published 14 years ago, the book has sold over 5 million copies worldwide, been named the nation's favourite story book in a Radio 2 poll and even has an Oscar nomination under its belt for the fabulous TV adaptation. Throughout 2014, watch out for the "15 years of The Gruffalo" celebrations as the world continues to go G-G-G-Gruffalo mad!" Upon entering the auditorium, I immediately liked the set design, and thought it was better than We're Going on a Bear Hunt's (the last show that we saw). Aaron chose his seat, but I had to shimmy him along a few, to our allocated ones. Because he is 3 years of age, he is starting to recognise the number 3 everywhere and wanted to sit on the seat with a 3 instead of ours = 10 and 11. He was happy and very excited but then the lights dimmed so he got off his seat, and hid, like this! 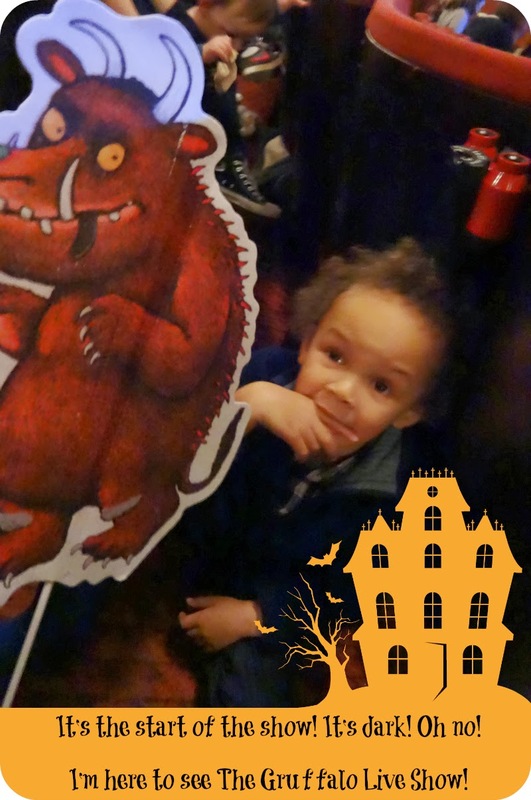 With his Gruffalo stick (that costs £4 from the cloakroom where you buy drinks on the way in - cash only). He soon realised that the two people on stage were one, both lovely and two, there wasn't yet a Gruffalo in sight. Funny that he was scared as he had seen TWO trailers with me at home, (this one and this one) which I deliberately got him to watch so that he wouldn't be! This was the back of his head, once he was hooked! The show is only 55 minutes long and is totally the right duration for little ones. Perfect for my 3 1/2 year old. No interval which means you don't have the drama of navigating the crowds but it does necessitate a toilet visit pre-show. There aren't any dull bits (like at the cinema) where you can sneak off to the loo! The script pays more respect to the book than We're Going On A Bear Hunt did. I did have to be really vigilant to catch the actual phrases from the book though, as they are given just a smidgen of extra emphasis. It was cute when Aaron joined in with a couple - we know the book SO incredibly well. The actress who plays the MOUSE is AWESOME. Her twitchy mannerisms and sheer energy/enthusiasm bounce off the walls. She doesn't treat the show as just children's theatre. No, she gets into character and really draws you in. It feels actually like she is the star of the show, rather than the Gruffalo himself. The way the tail of the mouse is used as a method for the fox, owl and snake to be predatory REALLY works. 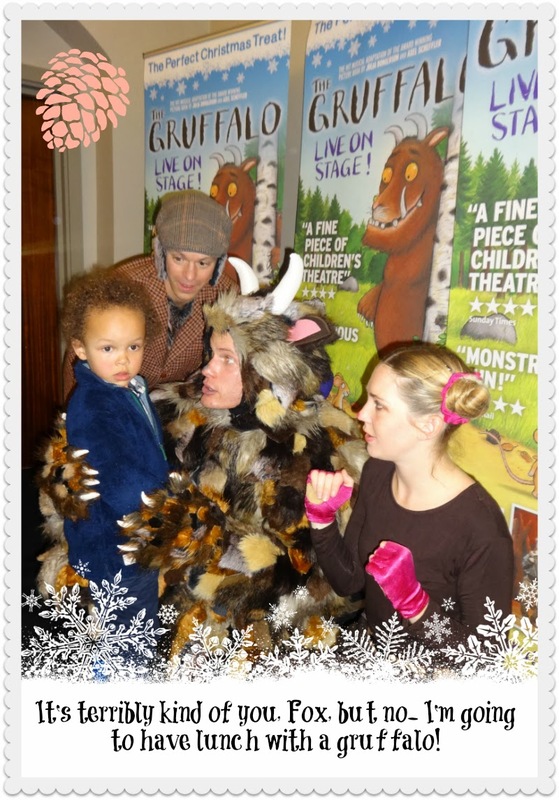 The Gruffalo's costume is spectacular, it has to be said! The music and lyrics are really good (again better than We're Going on a Bear Hunt) but I wasn't decided on whether to buy the CD that is on sale at the theatre for you to buy. 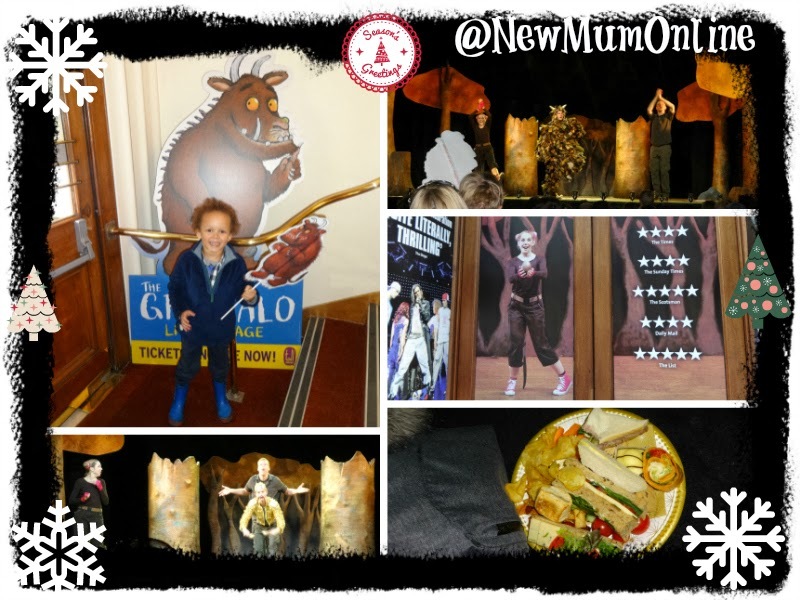 At the beginning of the show, when the mouse mentions the Gruffalo for the first time - in keeping with the fact that "there's no such thing as a Gruffalo" - she gets the audience to help her say the word, which really works and is the beginning of quite an interactive show! 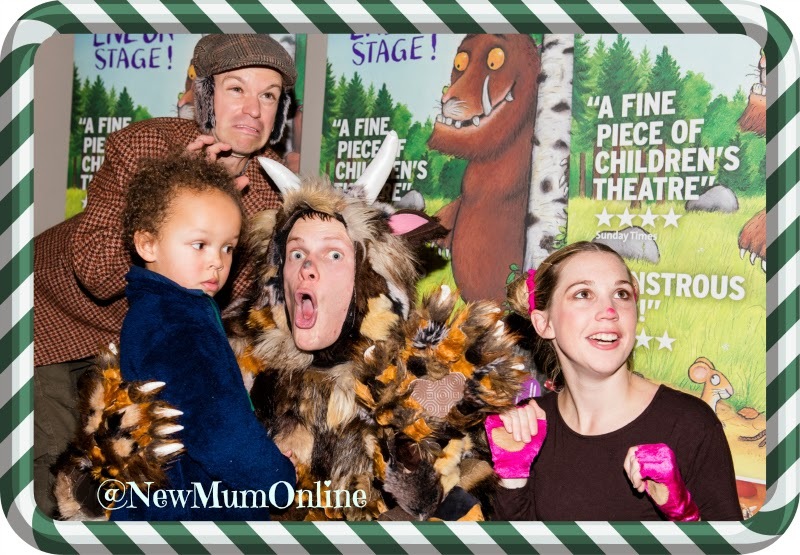 The Gruffalo Live is worth spending some time on before you see the show - beautiful website! All of the actors give believable child-friendly upbeat energetic performances. It is a show that children and adults will both love and to be highly recommended if you are fans of the book (or books! if you also have The Gruffalo's Child). Our books are hard back ones that my friend Siobhan gave Aaron. In fact every page is hard - they're really robust (Macmillan £6.99 each). The show is incredibly easy to get to with it being right by Piccadilly Tube Station. I love the way the mouse wishes everyone a Merry Christmas at the end when she is victoriously eating her nut! She deserves to be proud after scaring everyone in the deep dark wood. Memory told me that the Gruffalo was too jolly and not scary, and I just remember him dancing a lot, but I have the book next to me as I write this review and it reminds me that the Gruffalo does go with the mouse to meet the snake, owl and fox, and this was all done incredibly well. A memory has also sprung to mind of where the mouse hides between the Gruffalo's leg and he says "I can see a mouse's bottom" and pulls her out by her tail. References to poo or bums/bottoms never fail to get a laugh from children! I particularly liked the way the Gruffalo and the mouse stomped, to indicate that they were walking through the wood. Whenever they made reference to the Gruffalo's eyes being orange it seemed off that they weren't. Thanks to meeting him I think I can see orange lenses in my photos, but I think he needs tailor made orange type swimming goggles or some such thing, (obviously with discreet straps) so that even in row H, where we were, you can see it. The same applies to his non-black tongue. When they described his tongue as black, on stage, he simultaneously stuck it out and it was neither long, nor black. See no black tongue and no orange eyes! The Gruffalo actor is cheerful enough, as is his costume, so I think they can afford to be a bit more dramatic and a tad scary with his entrance. I didn't find this dramatic enough! Even little kids like to be a tiny bit frightened, which is why they spend half their time hiding behind corners and then saying BOO! which Aaron is yet to get bored of. The Gruffalo is quite dancey when he enters, which is a shame, after all of the buildup to his much anticipated arrival. I found the campness of the s-s-s-s-snake (mannerisms and costume) a tad irritating if I am totally honest. I feel bad saying it, as I received free entrance for Aaron and I, but I have to be truthful in this review. Similarly, I found it odd that the owl had to be a military character, where the owls in the deep dark wood were some kind of forest RAF. I'd say the only predator who escapes my criticism would be the fox. But then I like a good fox in every children's story (I especially like doing my fox voice when reading to Aaron)! The only drinks to buy on the way in were coke, diet coke, water or Fruit Shoots. Anyone who knows my blog knows I hate Fruit Shoots but thanks be to god they were the good ones - My 5 - which have no nasties so Aaron gulped it down. For my coke, Aaron's my 5 and the £4 Gruffalo stick it was £9. 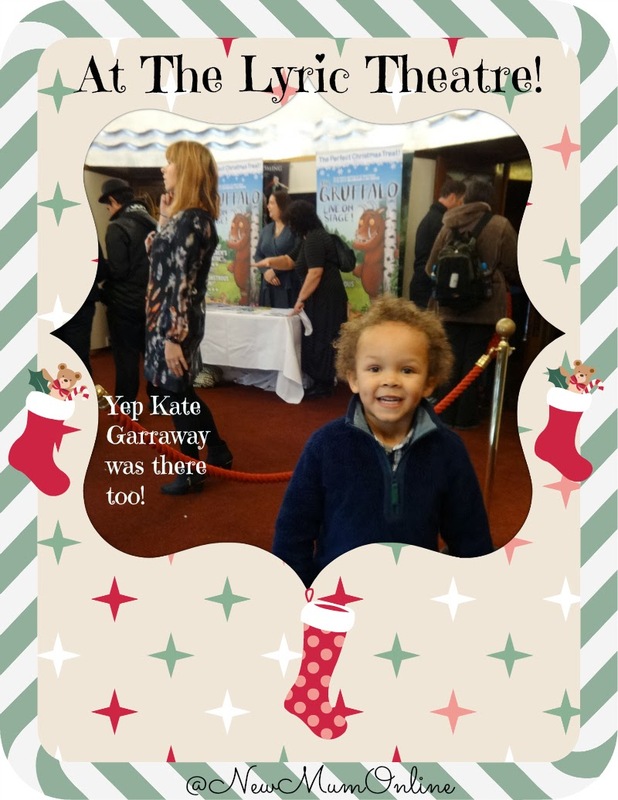 The Gruffalo stick has already become a treasured souvenir so I would heavily recommend getting one. Get their relatively early as they go like hotcakes. I think they sold 80 of them yesterday. Bless my Aaron; I got my stories mixed up at one point and I said this is where the mouse will get up and form a big scary shadow and say she carries a nut as big as a boulder. My little 3.5 year old was so quick to point out to me that no! That is from The Gruffalo's Child (which we read very often). Yes, of course, he is right! Silly Mummy! All in all I would give the show 4 out of 5 stars. If the snake wasn't quite so annoying, and the Gruffalo was a tiny bit more scary, it would easily be a five!!!!! 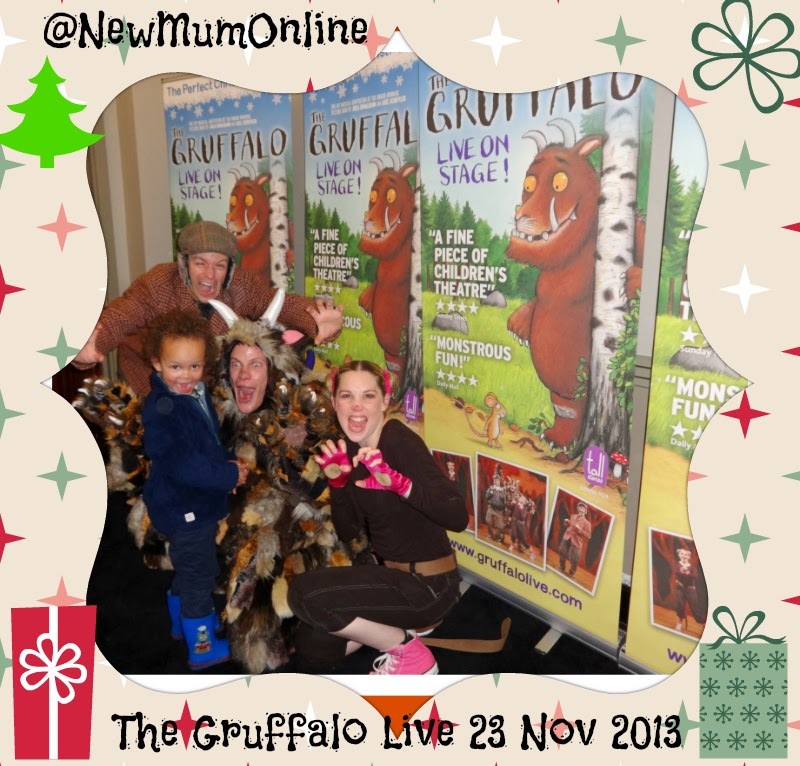 WELL WORTH seeing and if you are Gruffalo fans don't even hesitate. It won't ruin the book for you, as I have read it twice since home, and am still able to read it in our much loved rhythm. The show is running from 21st November 2013 to 12th January 2014 IN LONDON. BUT it then goes on: tour NATIONWIDE so this is far from a London affair. So no matter where in the country you are, get booking! Ooooh this looks amazing - off to look whether it's coming close to me, what a through review. Ooooh I have not heard of Room on the Broom. Our first time at Lollibop was this year and they didn't have it this time (The Gruffalo) ah well. Aaron's really looking forward to this year's Lollibop though.